Hello, loyal readers. 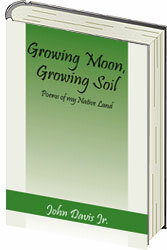 This is just a quick post to let you all know that my book, Growing Moon, Growing Soil: Poems of my Native Land, is now available as a Kindle edition. The digital version is far less expensive than the original paperback, but it maintains the character and artistry of the printed page. Please see the link below, and purchase your copy today! All proceeds will go toward advancing the literary arts in central Florida. Thank you as always for your support!